Bernie and I set out for a sunrise shoot on Saturday morning. Leaving home at 3am under a blanket of stars was promising, however by our first coffee stop just an hour later, the stars had vanished and a few specs of rain were starting to appear on the windscreen. We were still 40 mins drive from our planned location (an old rusty Austin truck on a country road) so we considered turning back, but... nothing ventured, nothing gained! Perhaps this was the morning for the clouds to break on the horizon and for the sky to fill with colour over our rusty old truck? We arrived on location and there was no break to be seen. In fact, the clouds were so heavy that it was still very dark, when it should have been getting light by this stage. Once again, we considered heading for home, but having come this far we thought we might as well try and find something to shoot. Knowing a lovely valley area located on top of a nearby range, we decided that it could be a great spot in the inclement conditions. The cloud was so thick that visibility for driving could be measured in just a handful meters, plus a strong wind was blowing and the raindrops were travelling horizontally. These were certainly NOT the conditions that we wanted for landscape photography. Head for home? we ask ourselves... Nah, we don't give up that easy. On the western end of the valley is the small farming town of Killarney and nearby fields are often full of colourful crops… This would be our new location and if that failed, we knew of a lovely little cafe just out of town and it makes great scrambled eggs. It was breakfast time after all and we had been up since 2.30am. 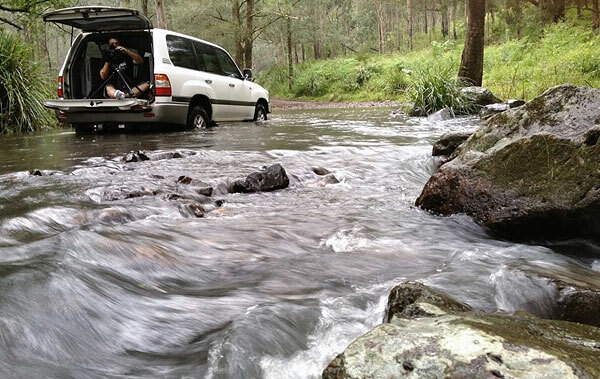 On-route however, we happen upon a side road with a sign reading "Condamine River - Water Over Road". Surely this would provide us with a photo opportunity? The road lead us down into the base of the valley, out of the cloud and wind and then into the rain forest. "You are about to cross the Condamine River 14 times" the next sign warns us. ...Sweet! Arriving at the first crossing, the water over the road was nothing too serious, so we decided to see what the other crossings would present to us. * It is at this point I should point out that we are driving a large 4x4 and have many years experience of off-road driving. River crossings are an everyday part of the 4x4 adventure and experience plus a bit of common sense plays a large part in determining if a crossing is safe. This crossing was most certainly safe! By the time we reached the third crossing however, the track was getting rougher and the rain heavy. Knowing that the Condamine can rise fast, we thought it best to make our way back to Crossing #1. Here we could make an easy uninhibited exit, should a rapid bug-out become necessary. As it it turned out, Crossing #1 was the most picturesque of the first three and proved an excellent subject for a panorama or two. The problem for us however, was the we had not planned for a wet weather shoot. No umbrella, no rain coat, not even an old shopping bag was on hand to afford our camera equipment some protection. To make matters worse, the best position for the shot was in the middle of the river crossing. Hmmm, there was only one solution…. Here Bernie is shooting with the GX617 panoramic film camera, using the Landcruiser for cover while parked in the Condamine River. Thankfully, the position required kept us in the shallows and the buffeting from the water was minimal. Any deeper however, and the small movements of the car would have been enough to ruin the long 1 minute exposures required by the film. This second 'wide field' image seen here was photographed using a high resolution technique and this allows it to be made available at all print sizes, including our largest of 75 inches (1.95m or "Huge"). So while our sunrise shoot may have turned foul, our morning was far from being a loss, as we returned with a number of new panoramics, a new location to explore for future photo shoots, full tummies of scrambled egg and at last count, about eight blood sucking little leeches! Nothing ventured, nothing gained…. and only a little blood lost. All in all, a great little adventure for a Saturday morning!